In 1848 James Thin founded the bookshop that bore his name. Situated in South Bridge, opposite the University’s Old College, the shop remained in the same family until 2002 when it was taken over by Blackwells. James Thin was born in Edinburgh on 23 March 1824. His father, George Thin, was a grocer who came from the Borders. His mother was Helen Ainslie. James was apprenticed to the bookseller, James McIntosh, who had a shop at 5 North College Street. Through his business he came to know some of the well known literary figures of Edinburgh at that time, including Lord Macaulay, Thomas De Quincey, Professor John Wilson (‘Christopher North’), Thomas Carlyle and Robert Louis Stevenson. 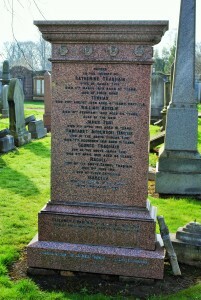 He died in his house in Lauder Road on 11 April 1915 at the age of 91. In June 1849 he married Catherine Traquair (1822-1879), and they had seven sons. Catherine died when she was just 47, and he subsequently married Elizabeth Darling (1834-1905). Two of his sons, George Traquair Thin (1851-1920) and James Hay Thin followed him into the business. Of his other sons, William Ainslie Traquair (1866-1900) was a solicitor who died at the early age of 34. Thomas Thin (1855-1896) went into the insurance business. He married Margaret Anderson Mackie (1847-1918). Thomas died at the age of 41, but Margaret lived to be 71, dying in 1918. Another son, Robert, became a doctor. He studied in Prague and Vienna, and was President of the Royal College of Physicians in Edinburgh. He died in 1941, aged 80. 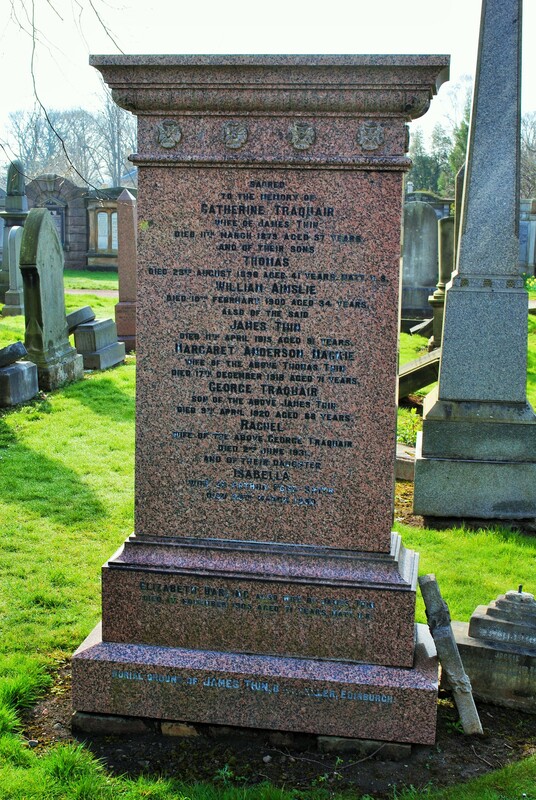 George Traquair Thin married Rachel Wells (1863-1931), and they had at least two children: Isabella (1881-1950), the wife of Arthur Ford Smith, and “Jockie”(1884-1895) who died aged 11. James Thin’s memorial also commemorates his wife, Catherine; their children Thomas, William and George; Thomas’s wife Margaret; and George’s wife, Rachel, and their daughter, Isabella. Nearby is a memorial to “Jockie”.